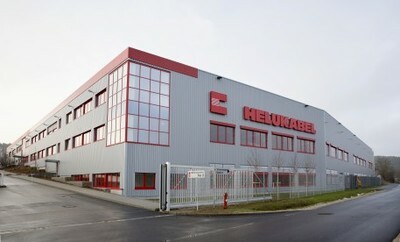 Construction of the extension to HELUKABEL’s production plant in Windsbach, Germany has successfully been completed. The new building provides more than 9,000 square metres of additional office, laboratory and production space. Parallel to this, a significant investment has been made in new production facilities. Their commissioning as well as the restructuring of existing machines are part of a three-year plan. The objective is not only to increase production capacity, but to optimise material handling. "At the same time, we took the opportunity to improve communication between the various production areas. Shorter paths combined with newly set up meeting zones will serve to enhance coordination between these areas and enable even leaner methods of working," says Thomas Pikkemaat, Windsbach Plant Business Manager and Drive Technology Product Manager. The Windsbach plant has been producing cables and wires since 1988. Since then, HELUKABEL has acquired an international reputation as an excellent manufacturer of high quality cables and wires. Approximately 160 employees work in the 40,000 square-metre plant, making application-specific and custom cables and wires that typically withstand extreme chemical, electric and mechanical stresses, such as narrow bending radii, and offer exceptional service lives. The primary focus is on products for moving applications with high vertical integration.